I know, I know. It’s cold outside, you’re tired, it’s so dark, you’re so busy, blah blah blah. News flash ladies, no one can MAKE you be healthy but you. You have to want it bad enough to banish those excuses and stay motivated. Things that have helped me stay on track and keeping up with my fitness are keeping a photo handy of me at the size/weight I’m aiming for. Looking at that photo reminds me that my body is capable of being where I want it to be – I just need to work for it. Another way I’ve managed to stay motivated is by doing classes at my local gym. I don’t know about you but I’m not good at going to the gym and doing a routine. I get bored, I don’t push myself hard enough and I rarely work up a sweat. In classes though, I don’t have to think. I just follow the teacher’s instructions and the group structure pushes me to work harder. Next thing I know, an hour has passed and I’m dripping sweat. In order to not get bored with the classes, I try to create a workout schedule that is realistic for me and where I’m hitting a few different classes a week. The key is find out what works for you, it’s not the same for everyone. Find what gets you motivated and do work ladies. So it’s a new year and I’m sure, like everyone else, you have losing weight or getting back in the gym on your list of 2014 resolutions. The biggest mistake people can make is pushing themselves too hard too fast. You have a whole year to complete this goal and you don’t want to burn yourself out right at the beginning. Since you spend the majority of your time at work, why not start there. Introduce some easy fitness tricks/swaps here and there throughout your work day and build on those. For example, I bought a stability ball online and go back and forth from the ball to a chair throughout the day at work. The longer I can stay on the ball the better of course, but I’m working on it little by little. You may feel funny sitting on the ball but when your co-workers catch wind of how much better your back feels, how your posture has improved, and your core has strengthened, they will be lining up to borrow it. Another easy way to incorporate some fitness into your work day, every hour get up and take a quick lap around your office, or to the break room for some water. Try to make this break last about 10 minutes, if you don’t have anywhere to walk too, do some light stretches near your desk. Again, may look silly but when you don’t have the classic ailments of a desk worker you’ll be thanking me! 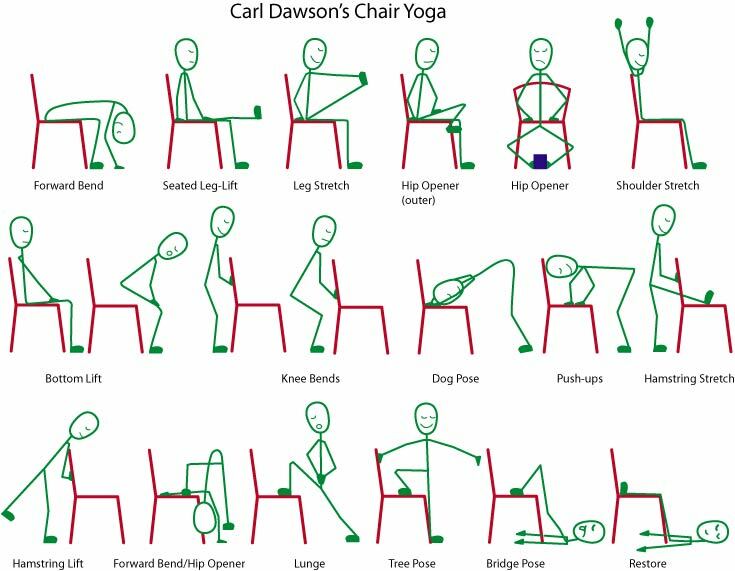 Lastly, check out this diagram for some easy and helpful chair yoga poses! Which is your favorite? Get Rid of Those Pesky “Love” Handles! 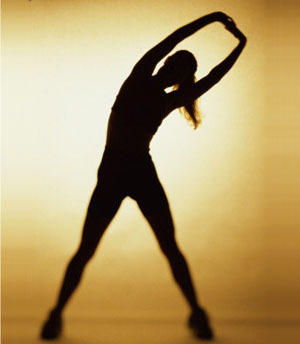 Tired of that extra little flab hanging out around your hips? Try these easy to do, even at home, fitness tip! All you’ll need is you, a flat surface, and a broom or something of similar shape. Standing on the flat surface with your legs spread shoulders width apart, hands holding the broom straight up above your head. Keeping your arms straight, bring them down to your right side as far as you can go, remembering to keep your arms and legs straight. Slowly, return to your starting position, then move to your left side. This is 1 repetition. Start off doing 6 reps at least 3x, and gradually work yourself up to more. In a few months, maybe even a few days we guarantee you’ll notice a difference! What fitness tips do you have to share?